What would a Higgs at 125 GeV tell us? The rumours tell us that next week ATLAS and CMS will announce a strong but inconclusive signal for the Higgs boson at about 125 GeV. This may be wrong and even if it is right there may be other candidate signals to think about, and it will take much more data to verify that the signal is indeed correct for the Higgs, but if it is right, what then are the implications of the Higgs at this mass? This question will be the subject of much discussion in the coming months and I can only touch on it here. Certainly the central topic of the debate will be the stability of the vacuum and whether it implies new physics, and if so, at what scale? It has been known for about twenty years that for a low Higgs mass relative to the top quark mass, the quartic Higgs self-coupling runs at high energy towards lower values. At some point it would turn negative indicating that the vacuum is unstable. In other words the universe could in theory spontaneously explode at some point releasing huge amounts of energy as it fell into a more stable lower energy vacuum state. This catastrophe would spread across the universe at the speed of light in an unstoppable wave of heat that would destroy everything in its path. Happily the universe has survived a very long time without such mishaps so this can’t be part of reality, or can it? As it turns out a Higgs mass of 125 GeV is quite a borderline case. The situation was analysed taking into account the best recent valued for the top mass and weak coupling constants by Ellis et al in 2009. 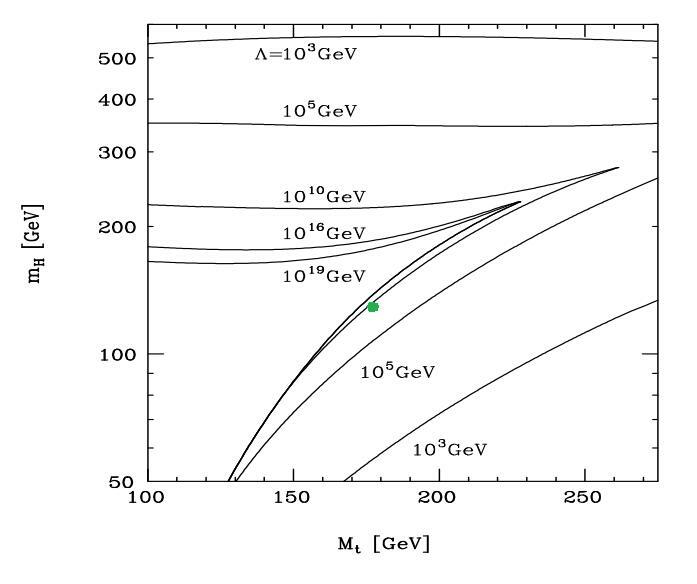 Here is their most relevant graphic with a line running across at 125 GeV (plus or minus 1 GeV) added by me. The horizontal axis tells us the energy at which the coupling constant goes negative. The yellow band indicates the limit for vacuum stability. Because of uncertainty in the top mass and the weak coupling, and also due to some theoretical unknowns, the exact point at which this limit is reached is not known exactly. The yellow band covers the range of possibilities. 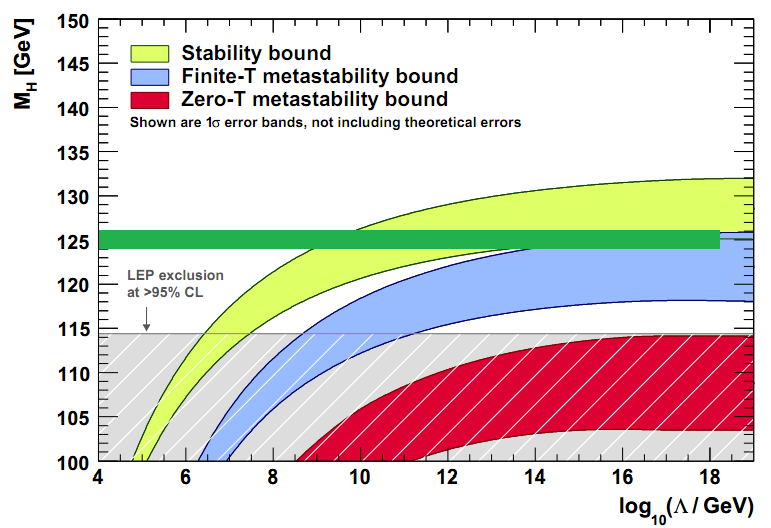 The second plot taken from Quiros shows the scale of instability as a function of Top and Higgs mass. I have added a green spot where we now seem to live. At 126 GeV the vacuum might remain stable up to Plank energies (see e.g. Shaposhnikov and Wetterich). If this is the case then there is nothing to worry about, but depending on the precise values of the standard model parameters, instability could also set in at energies around a million TeV. This is well above anything we can explore at the LHC but such energies are found in the more extreme parts of the universe and nothing bad has happened. The most likely explanation would be that some new unknown physics changes the running of the coupling to avert it from going negative. Examples of something that could do this include the existence of a Higgsino or a stop as predicted by supersymmetry, but there are other possibilities. It is also possible that some amount of vacuum instability could really be present. If there is meta-stability the vacuum could remain in its normal state. There would be the possibility of disaster at any moment but the half-life for the decay of the vacuum would have to be more than about the 13 billion years that it has survived so far. In the plot above the blue band indicates the region where a more immediately unstable vacuum is reached. It is unlikely that this case is realised in nature. As the plot shows, if the mass of the Higgs turns out to be 120 GeV despite present rumours to the contrary then the stability problem would be a big deal. This would be a big boost for SUSY models that stabilize the vacuum amd mostly prefer the light Higgs mass. If on the other hand the Higgs mass was found at 130 GeV or more, then the stability problem would be no issue. 125 GeV leaves us in the uncertain region where more research and better measurements of the top mass will be required. It will still encourage the SUSY theorists as work such as that of Kane shows, but the door will still be open to a range of possibilities. There are other things apart from the stability of the vacuum that theorists will look at. What is the nature of the electro-weak phase transition implied by this Higgs mass? Can it play some role in inflation or other phenomenology of the early universe? How does the result fit with electro-weak precision measurements and what else would be required to reconcile theory with experiment in such tests, especially the muon magnetic anomaly? 2011 has been a great year for the experimenalists but next year the theorists will also have a lot of work to do. A rumour that reached our comment section suggests that a signal for the Higgs boson has been seen at 125 GeV with 2-3 sigma significance. This would be a great result if confirmed because at this mass the standard model has problems with vacuum stability that are likely to require supersymmetry or something similar to stabilize. If on the other hand the Higgs were at 140 GeV we would be left with a simple but unsatisfying model that could exist without modification up to energies well beyond anything we can explore in man-made experiments. In other words we might never be able to detect anything new. A Higgs that is just 15 GeV lighter is a different story altogether, so theorists will be very happy if that is the answer. A statement by the CERN DG circulated to staff says that the results that will be released on 13th December will be inconclusive. This means that a 5 sigma signal is not yet available. A Higgs signal at 140 GeV would probably be conclusive, at least with the 10/fb of data combined, but of course the combination has not yet been done. In other words, the inconclusion is consistent with the lighter mass but not conclusively. Another rumour says that the signal is only seen in the diphoton end state for both experiments. This again suggest the lighter mass because anything in the range 130 GeV to 150 GeV would show up strongly in the ZZ to 4lepton channel but 125 GeV wont. Oddly enough the diphoton channels up to 3/fb combined showed no excess at 125 GeV, but events at this mass would be very rare and if there is a signal it will be just a few events on the 10/fb sample. With an inconclusive signal the combination of results from ATLAS and CMS is all important. Approximate combinations of the type I have been doing will be good indicators but only the carefully prepared official combination can lead to a definitive result. Last month I looked at best fits to the combined summer data and found the 140 GeV signal to be best. If I do a fit to a two Higgs model I get a second one at 128 GeV. 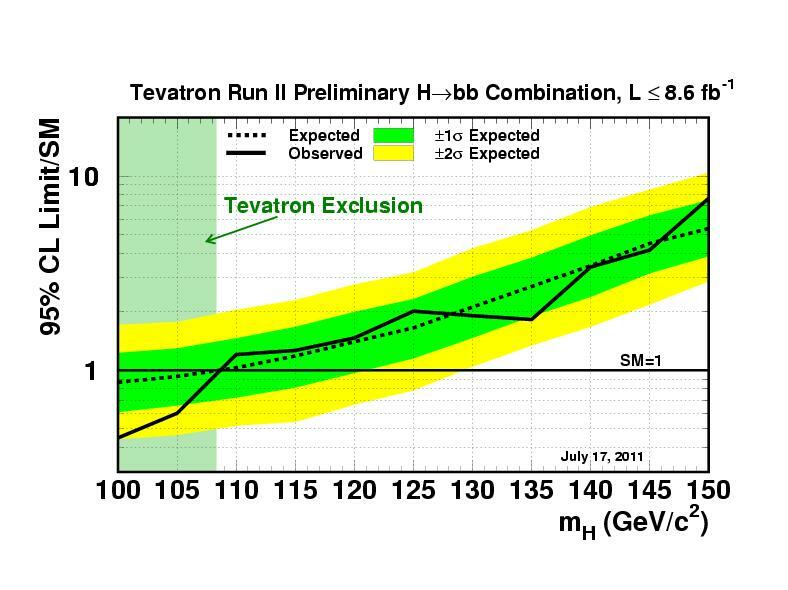 The lighter peak at 119 GeV favoured by Italian bloggers has error bars too big to grab the second place. It is going to be very interesting to repeat this with the 10/fb of data and see if both of these signals survives the fit. One last thing worth mentioning is that the gfitter calculations have been estimating 125 GeV for the Higgs mass for some time as the best fit. Well done to them. This would mean that if it is confirmed at that mass, no further physics is required at this energy to account for precision tests. On the other hand, gfitter calculations also fit doublet models well to the data so other physics is not ruled out either. Another piece of good news is that the results meeting on 13th December will be webcast. Unless they enlist the services of a heavy-duty streaming service their normal webcast channels will certainly be overwhelmed by the public interest in this event which has already been reported by the BBC, Telegraph, Guardian, and many others. 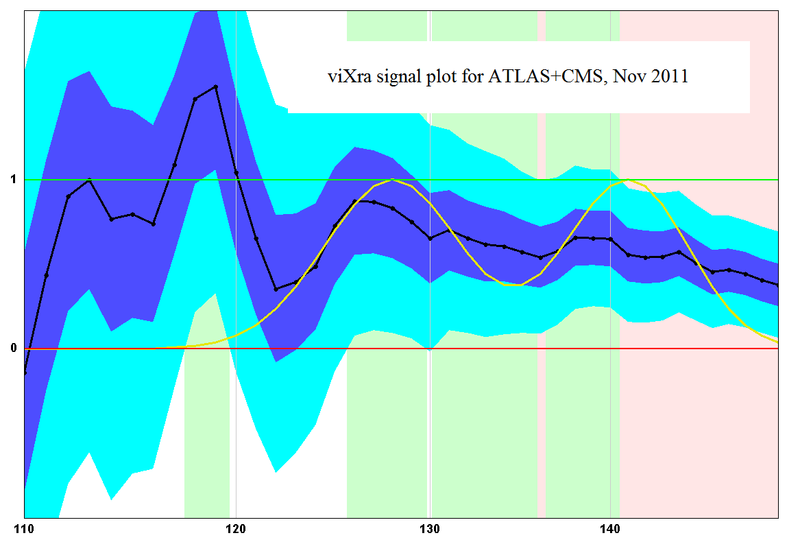 Update: The latest version of the rumour at NEW gives 3.5 sigma in ATLAS and 2.5 sigma in CMS which amounts to about 4.3 sigma combined for the 10/fb. This is about right for the expected significance at this mass. Tommaso’s post at QDS is worth reading but we will need to wait until the official announcement for his analysis because he knows too much. Update 4-Dec-2011: Nature blog has an interesting snippet of news about the rumours including a comment from Bill “Nonsense” Murray who says that ATLAS collaboration approvals will (hopefully) be finalized at a meeting on 7th December, followed by management approvals. Update 8-Dec-2011: The BBC has run another story including an interview with John Ellis and a quote from Sergio Bertolucci that “I think we may get indications that are not consistent with its non-existence.” As director of research at CERN Bertolucci is likely to be one of a very small number of people who have officially seen both sets of results from CMS and ATLAS. On the 12th December the CERN council will meet and announce the latest news about the search for the Higgs boson to its member states. This will be done in closed meetings but the next day the spokespersons for CMS and ATLAS will deliver 30 minute talks each in public. There will then be a discussion period of one hour. Hopefully this indicates that some meaningful result has been obtained and they will be able to tell us what the Higgs mass is or that it does not exist in the Standard Model form. Unless they do their own approximate combinations I will be doing them myself here. This means I will have to digitise all the points in the CMS and ATLAS plots and run them through my spreadsheet. However, the real interest may come from the diphoton and ZZ channels so I will have to digitise another four plots and combine those too. I am going to be very busy but I will aim to have it all done before the end of the discussion period, unless they find some way of foiling my evil plot such as by not posting the plots online until later. See also NEW and TRF. You are currently browsing the viXra log blog archives for December, 2011.